By 2019, two new Staten Island Ferry vessels should be crisscrossing the New York Harbor. Outside of the Whitehall Ferry Terminal this morning, United States Transportation Secretary Anthony Foxx announced that New York City had been awarded a $191 million grant to design and construct these vessels that will be more agile and storm-resilient than what's in the ferry's current fleet. These funds will also allow the city to invest in resiliency measures at the ferry's terminals and at surrounding public transit systems. This federal grant was just one component of the U.S. DOT's latest round of Sandy-related funding, which provides over $3 billion for resiliency measures for the East Coast's public transit systems. Roughly 90 percent of this money is allocated for projects in New York State and New Jersey. 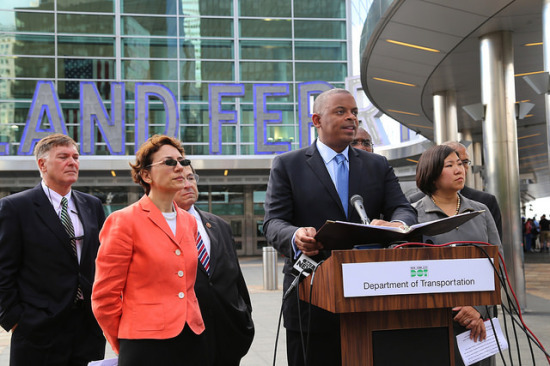 “The projects we are funding aren’t exactly what you would call glamorous projects,” said Secretary Foxx at the announcement, “many of them will be invisible to many riders, but they will give this region a fighting chance to withstand the kind of punishment that mother nature can mete out.” To prevent the type of catastrophic flooding seen at the South Ferry subway station during Hurricane Sandy, Foxx said street-level vents would be sealed and pump rooms would be flood-proofed. As the city and state continue to rebuild after Sandy, though, there are difficult questions about whether areas that are especially vulnerable to rising sea levels should be rebuilt at all. When asked about that issue by AN, New York City Department of Transportation Commissioner Polly Trottenberg said the city would not stop building in threatened areas. “This region is home to 15 million people and clearly we are here to stay," she said. "I think our job is to make wise decisions about where to make investments, but, certainly, I think you can see from where we are in Lower Manhattan, which is one of the financial capitals of the world, we’re going to be rebuilding, and we’re going to making it stronger than ever.” Today’s press conference comes a day after roughly 400,000 people marched through the streets of Midtown, Manhattan in the People's Climate March—the largest climate march in history. Event organizers hope the massive showing will pressure global leaders to take action on climate change at the UN Climate summit this week. Ahead of that march, Mayor Bill de Blasio announced that New York City will attempt to cut its greenhouse gas emissions by 80 percent by 2050, based on 2005 figures. To achieve this very ambitious goal, the city said it will retrofit its 4,000 public buildings and incentivizing private building owners to increase energy efficiency. Specifically, the city pledged to invest in on-site, green power generators, install 100 megawatts of solar capacity on over 300 public buildings, and to “implement leading edge performance standards for new construction that cost effectively achieve highly efficient buildings, looking to Passive House, carbon neutral, or ‘zero net energy” ‘strategies to inform the standards.” Mayor de Blasio's climate plan builds upon Mayor Bloomberg's, which set out to reduce the city's greenhouse gas emissions by 30 percent by 2030. We've known for a while that Tom Prendergast and Anthony Foxx would be leading New York City's Metropolitan Transportation Authority (MTA) and the U.S. Department of Transportation for a while now, but now it's official. The New York State Senate has confirmed Prendergast has been appointed as the new chairman and CEO of the MTA and Congress has okayed President Obama's selection of Anthony Foxx as the new Secretary of Transportation. Prendergast, who has extensive experience working in the transit system, is replacing Joe Lhota who left the position to run for New York City Mayor. With Prendergast's new role comes the heavy responsibility of managing an annual $13 billion dollar budget and effectively serving 8.5 million commuters per weekday. Anthony Foxx, former mayor of Charlotte, North Carolina, replaces Secretary Ray LaHood, a notable enforcer of safety who initiated a strong campaign against distracted driving. Foxx says that he will follow from LaHood’s example, making safety a priority as well.